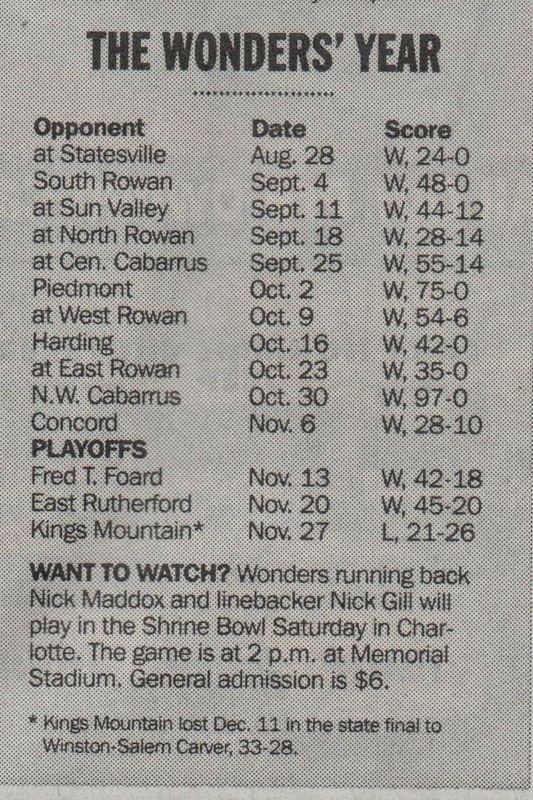 "A look Back at the Defending State Champions Year"
In early 1998 The Charlotte Observer sent a writer Scott Fowler along with a photographer Christopher Record to Kannapolis with the intent to follow the defending state AAA champion Wonders during their quest for back to back state titles. What transpired was a story that went far beyond the playing field, and into the heart of what makes Wonder football what it is today. Overcoming challenges to achieve perfection no matter what the circumstances. I remember reading this story just a few short weeks after the Wonders lost a heartbreaking third round battle to the Mountaineers of Kings Mountain. 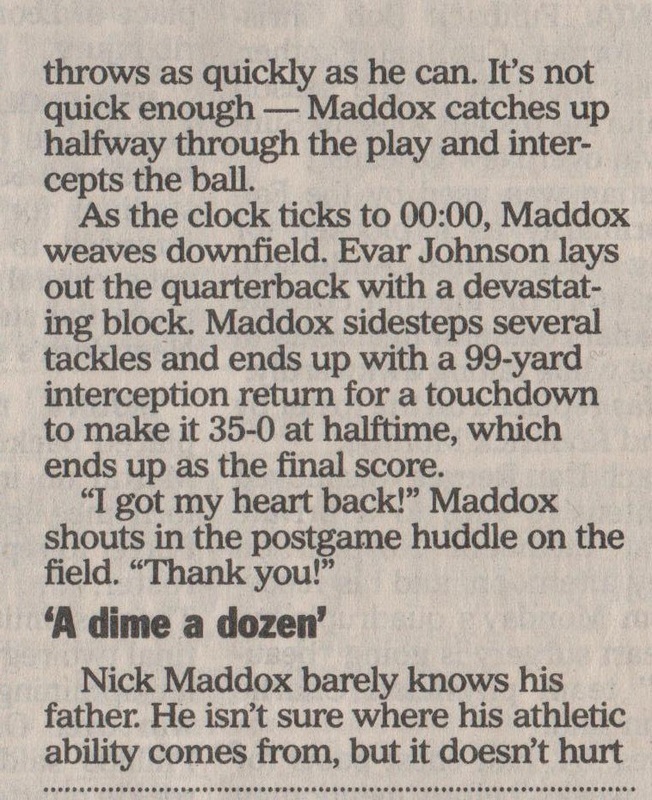 While creating this site I recalled having read this story, and thought how great it would have been to have kept a copy to scan an repost for Friday Nights in K-Town. 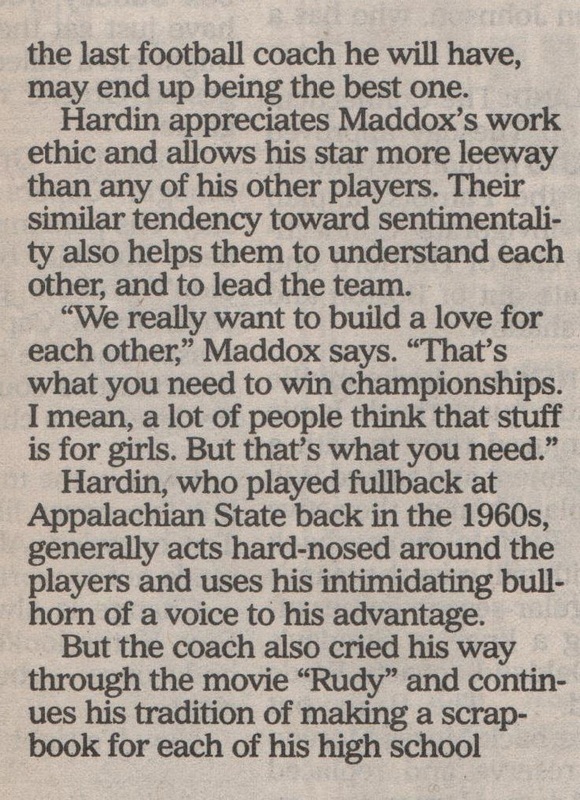 It was during a conversation with Will Craft I learned that Pat Maddox the mother of Wonder great Nick Maddox was still living in the same home she, and her son had during the glory days of 1997-1998. 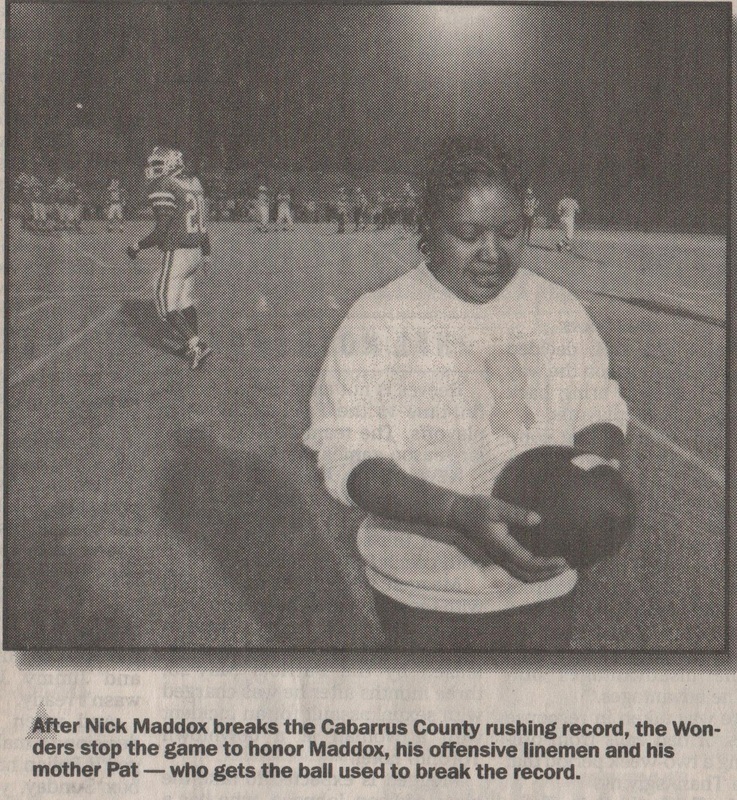 I decided to pay Ms. Maddox a visit one night, and was greeted at the door just like the very first time I went to her home to get Nick to sign a football helmet for me. We sat down in her livingroom, and began talking about the glory days. At one point in the conversation I told Ms Maddox what I was trying to do with the site, and asked her if she had anything I could take with me and scan? Maddox walked into her bedroom, and came back with a large shoebox loaded to the top with old clippings and photos. As I scanned through the box I was amazed at what all she kept, but after all we are talking about the proud mother of Nick Maddox aren't we? As I was scanning through the box I lifted a picture out which was sitting atop a stack of newspaper articles, and to my surprise there it was the entire series the Charlotte Observer had published back in 1998. "The Wonders Year" as it is titled documents the story of the 1998 defending state AAA champion's season much better that I could have written personally, and went much further behind the scenes than I could have gone. 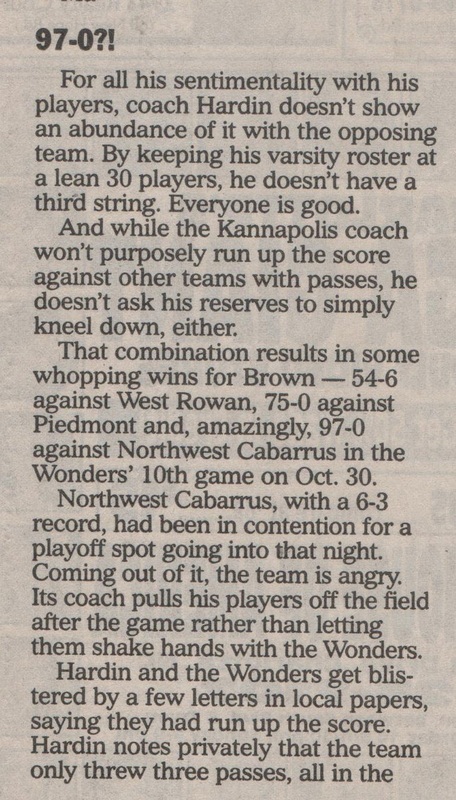 It's a story of success, and a new all time Cabarrus County rushing leader, A story of mis matched socks, and one highly controversial 97-0 win. It's the story of a team trying to find a way to move a mountain, and the heartbreak of a mountain that wouldn't be moved . It's the story that in my estimation defines that great team of 1998 better than anything I know. Just as I was blessed by running into William Craft almost a month ago I felt that same great fortune had once again smiled down upon me where this story is concerned. 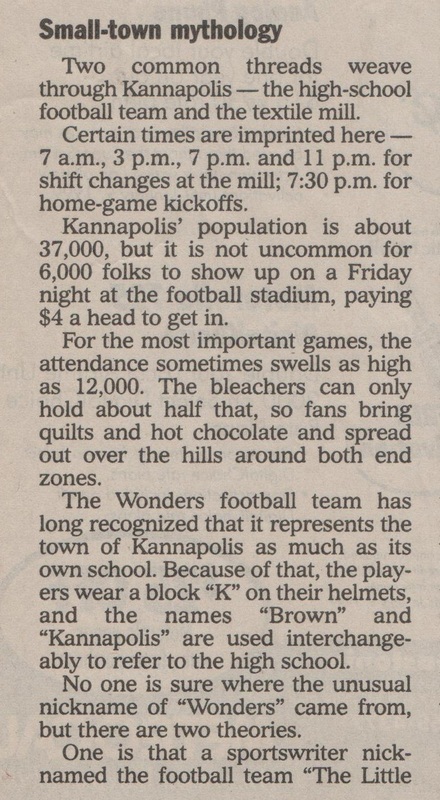 Friday Nights in K-Town wants to personally thank Wonder Mom extrordinaire Pat Maddox for allowing me the opportunity to look into her secret memory box, and for allowing me to share with Wonder nation the story of a year that is very special in our history.